I have a new set of free Photoshop Actions to share with you all today. These Winter Blues photo effects are designed to complement your cold and snowy photographs by enhancing cloudy skies and converting boring overcast greys to subtle cool hues. There’s 10 Actions to choose from, each with a different style that best suits a specific type of image, but they can all be used to enhance your pictures with interesting effects all year round! 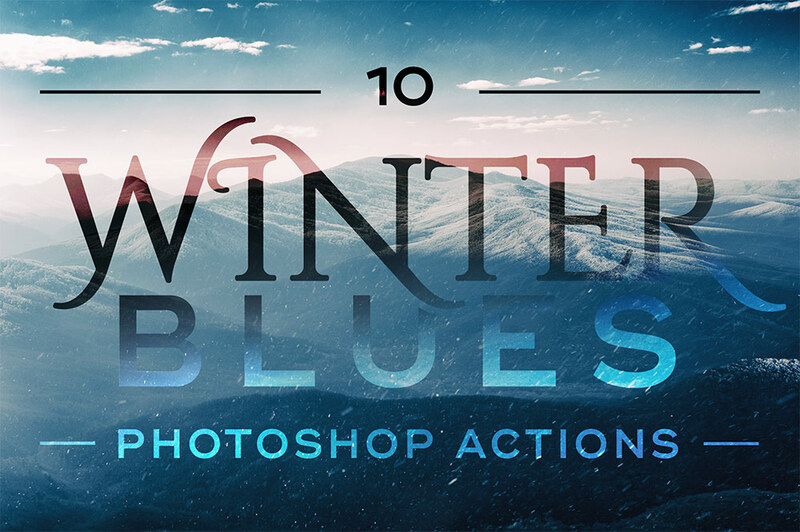 Load the downloaded .ATN file into Photoshop, then choose one of the 10 Winter Blues recordings and press the Play icon in the Actions panel to process your image with a range of preset adjustments. To fine tune the result, adjust the Opacity of the Group to tone down the impact of the effect, or dive into the adjustment layers and manually change the settings. Reduces the temperature of your photographs with cold blue hues. Applies a sharp cyan overlay with high contrast adjustments. Mixes deep blue shadows with golden highlights to enhance wintry landscapes. Combines low contrast adjustments with a fresh glacial turquoise colour cast. Leaves a covering of bleak blue-grey tones with a strong matte effect. Picks out any remaining greenery from trees and foliage in landscape shots. Darkens images with a deep blue colour cast and low contrast adjustments. Brings out the warm tones of photographs taken with a low sun in clear skies. Intensifies bright cyan blue colours for a cold but vibrant photo effect. Forms a dark mood with washed out colours and deep blue shadows. Thanks, Chris, they are awesome! Glad you like the effects Alexander! where (what) folder do I place the winter blues.atn inside? Simply double clicking the ATN file should load the actions directly into Photoshop. Alternatively, click the ‘Load Actions’ menu in the Actions panel and navigate to wherever you downloaded the file to. I have been seeing videos on adding blues to an overall image. I love that effect! These will help! Hi Chris. I am already on your mailing list. Can I still receive this bundle? I may just be missing it, but I don’t see a link to download. Thanks for the help. LOVE your tutorials! Never mind. It downloaded and I didn’t realize it. Obviously I need to clear off my desktop. :) Thanks again for all of the amazing tools. Thank you for the Winter Blues Actions. Thank you very much for your generosity. I’m so appreciative. You create amazing work to inspire. Wishing you a magnificent day. Thanks Chris! very generous of you.. These look beautiful and I can’t wait to try them out! Thanks Chris. These Winter Blues effects are fantastic! I tried opening in Photoshop and downloading followed by double clicking. Where on my Photoshop page would the .atn app appear? Is there a different application for the States?